EveryDrop™ is a water maximizer designed to move more water into the soil. 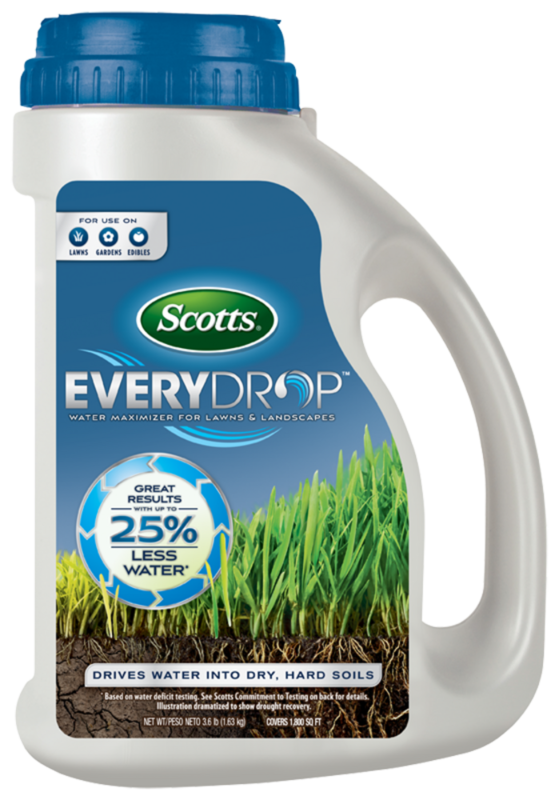 EveryDrop™ is a unique formula of wetting agents, which help more water penetrate soil and get to the roots - where it is needed most. More water in the soil means less is wasted through surface runoff and pooling. One application lasts for four weeks, so no matter how you water: relying on rain, sprinklers, or hoses, EveryDrop™ helps maximize the water in your outdoor space. Whether through product solutions or changing habits, you can manage water usage and save precious drops more efficiently. Container covers 1,800 sq. ft. (about the size of 10 car parking spaces). Walk at a moderate pace as you shake EveryDrop onto the ground. Use the reference picture, found on label, to estimate correct product coverage. For gardens and edibles, one cup covers 185 sq. ft. Product is rain-activated, or water in for immediate activation. If applied to edibles, wash before consuming. This package applies 2.0 lb. product per 1,000 sq. ft. Helps Cut Water Waste *Results will vary due to soil and turfgrass type. See product label for details. Product has an indefinite shelf life.